One of our favorite stories from the 2012 London Olympics has been the rivalry between U.S. swimmers Michael Phelps and Ryan Lochte. Phelps has accumulated 19 total Olympics medals in his career (and 15 golds), while Lochte won their first head-to-head 2012 Olympics contest in the 400-meter individual medley last Saturday. 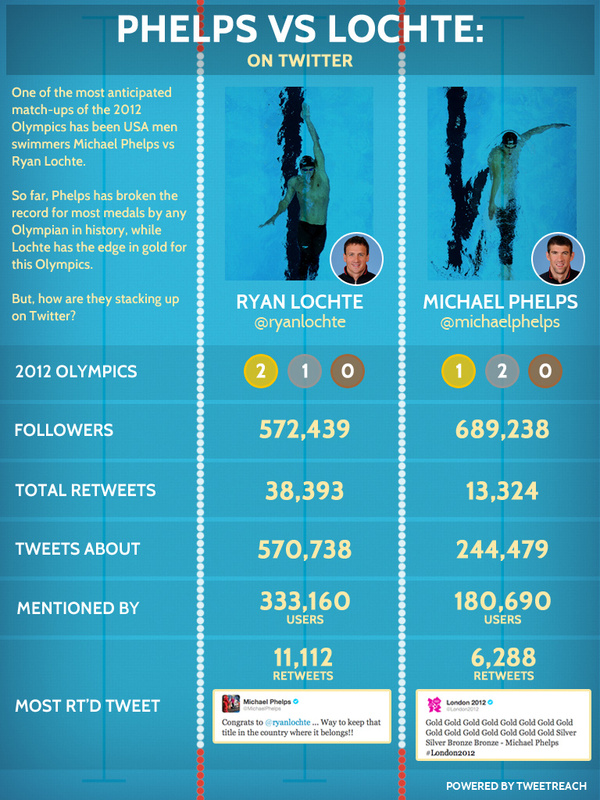 Since we’ve heard so much about how the men compare in the pool, we thought we’d take a look at how Michael Phelps and Ryan Lochte have fared on Twitter so far during the games. Click the image for the full-sized version. Interested in doing your own analysis of Olympics tweets? Let us know!